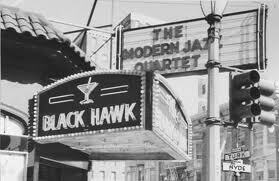 Blackhawk Jazz Club–San Francisco——–I saw Dave Brubeck and Miles Davis at this club. Though it closed its doors in 1963, a half-dozen classic recordings made at San Francisco’s Blackhawk nightclub have ensured a secure, lasting renown for the club in jazz lore. Along with other, long-gone clubs such as New York’s Royal Roost, Chicago’s Blue Note, and Philly’s Showboat and Peps’, the Blackhawk enjoys a mythic status as a club where all of the great post-war small groups played; Thelonious Monk, Miles Davis, Cal Tjader, Ahmad Jamal, Billie Holiday… if they played San Francisco, they played at the Blackhawk. Last month a bronze plaque was set into the sidewalk on the corner of Turk and Hyde in the Tenderloin to mark the spot where the Blackhawk once stood. Previously, the intersection’s northeast corner offered no hint of the jazz significance of the site serving only as a parking lot and hang out spot for the homeless and wanderers. 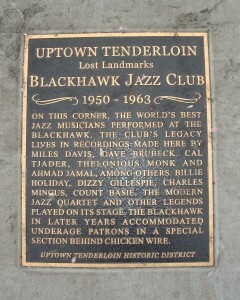 Now, thanks to the dedicated work of the Uptown Tenderloin Historic District, the corner has been marked as a pilgrimage site for jazz fans. On my recent visit, it was difficult to image the club or the night Miles and Hank Mobley burned through “Oleo” there fifty years ago–I was too busy deflecting appeals for pocket change and offers of “buds”–but it was nice to associate a physical location in the city with what I have read and heard about the club. 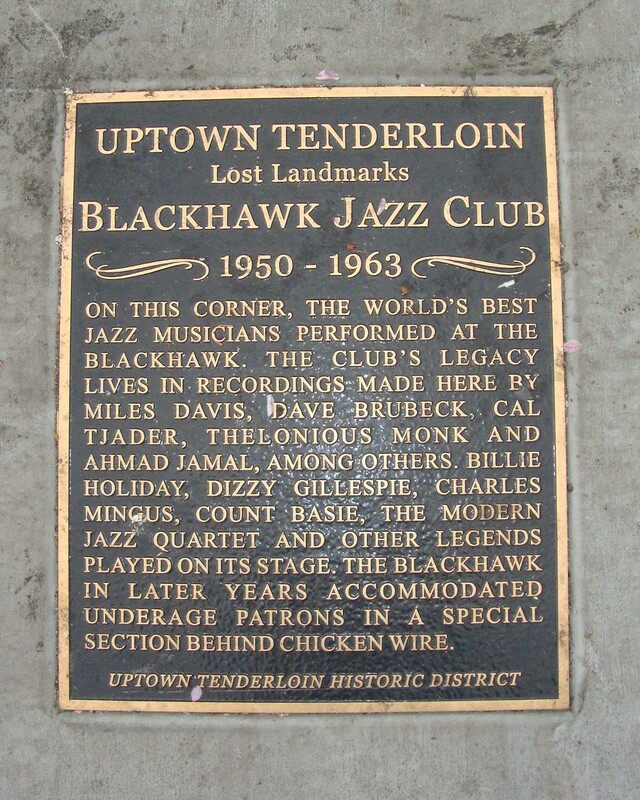 While the Tenderloin has experienced gentrification in recent years, it seems unlikely that tourists will serendipitously discover the corner’s new plaque on their own; the site of the old Blackhawk rewards the more deliberate and devoted visitor. I too spent time there in the 50s; saw Brubeck, Tjader and George Shearing – while in high school, and JC – never turned away despite my young age. Is that sleazy?